I thought you might like to see how this reproduction commission is coming along. Supplies are gathered, the studio is clear of other distractions and it was time to start. 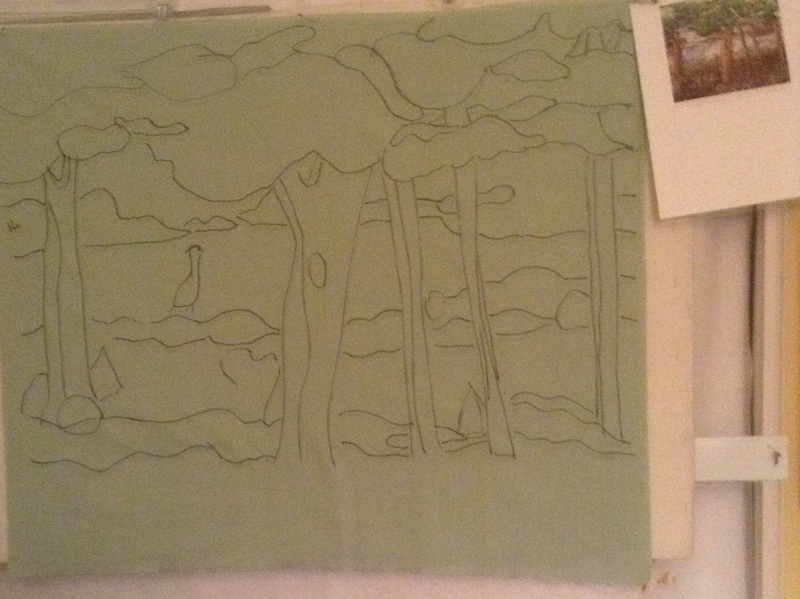 I printed a photo of the quilt then using a marker, I outlined the shapes for the cartoon. This was so I could project it onto my base cloth with my Artograph. This tool made this task easy peasy. You can see the cartoon on the right and the projected image on the cloth. The exception is all the tiny pieces that make up the leaves. There is so much stitching it was hard to find where one fabric started and the other ends. I will trace the shapes onto Steam a Seam. After fusing to the fabric the shapes will be cut out and fused to the base. This is so different from the way the original was created! Lookin’ good! I always wanted an artograph. Thanks! It usually lives under a shelf, deep in the closet. But, it was perfect for this project.